While suicide bombings in Kabul increase in size and regularity, violence continues to sweep across Afghanistan with the Taliban tightening its grip, now controlling an estimated 35% of the country. A record number of Afghans are leaving the country, many of whom are ending up in Europe. VCNV continues to support our friends, the Afghan Peace Volunteers, who struggle with each passing day. Lately, much of our contact with the APV has been to check that they haven't been caught up in a recent attack, or to offer words of support to young spirits whose hope flickers in the dark. 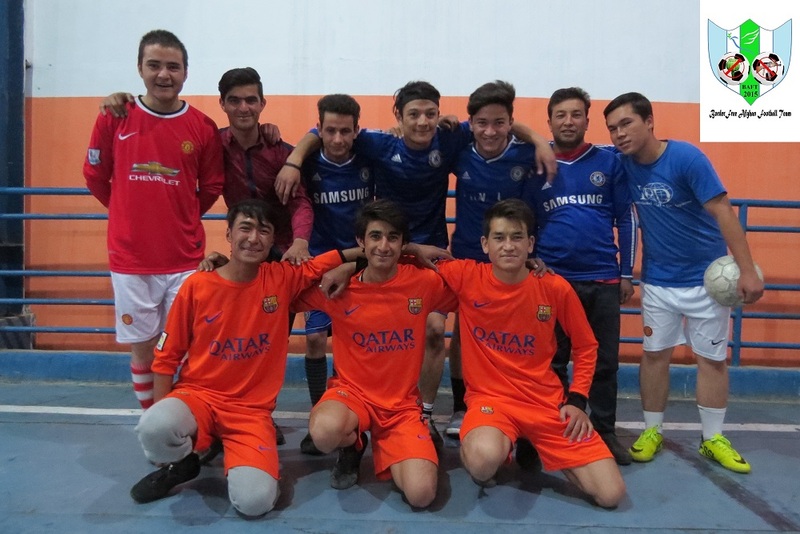 And yet our friends in Kabul keep going, their work keeps expanding and their group keeps growing. This year we would like to continue our show of support by financially contributing to their ongoing grassroots projects. Members of the APV, still teenagers themselves, teach basic literacy and numeracy to 100 street kids once a week, every week, as well as additional classes in peace education. 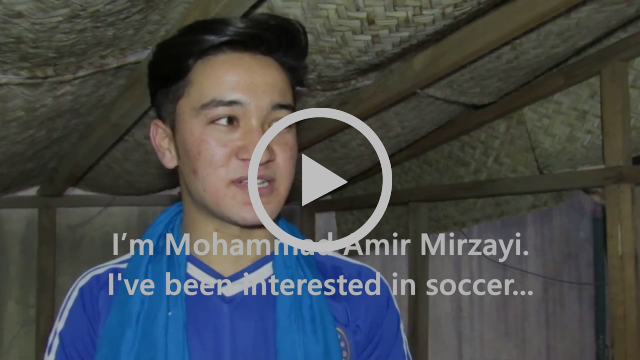 There are an estimated 60,000 street kids in Kabul alone, important bread winners for their families, sacrificing the chance of an education to work for less than £1.50 per day. The APV's grassroots initiative supports and nurtures 100 street kids, who, within a year, all reach a basic standard in literacy. It gives hope and satisfaction to the young members of the APV, as well as an opportunity to some of the most vulnerable within Afghanistan today. It costs £345 to put one street kid through the street kids school for 1 year. Please note that 92% of the cost per kid is spent for the monthly sack of rice and bottle of oil that each street kid gets; this is to subsidise their family and make up for any lose of income while the kids are in school. Here in the UK we keep talking about Afghanistan, a looming civil war which our Government has played a part in creating. 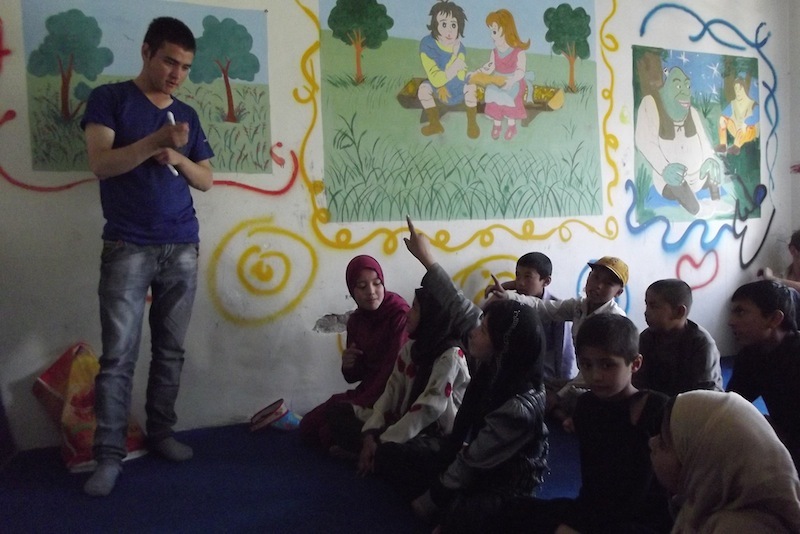 This year we have also been focusing on Afghan Refugees within Europe, offering ground support and raising awareness. Although Afghanistan has dropped out of the newspapers and our Government deems the country safe to return refugees, we continue to shine a light on Britain's responsibility and to maintain close links with friends in Kabul. In the next few months VCNV will be visiting Kabul to show our ongoing solidarity and support. Please consider making a donation this winter, all proceeds go directly to the Afghan Peace Volunteers and their 22 various projects. Many thanks to the Clapton Ultras for raising £224 which will cover the cost of hiring a practice pitch for the next 6 months. 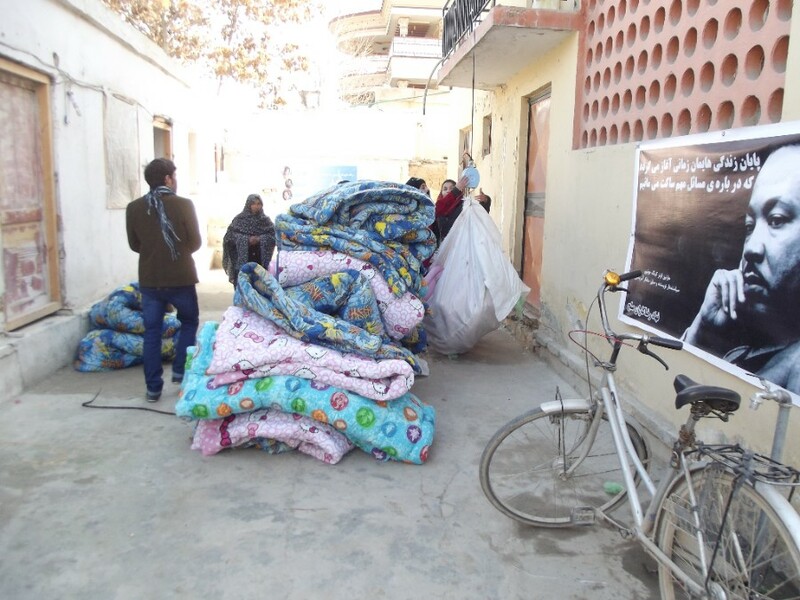 Employing local women, providing warmth to some of the poorest within Afghanistan today. Educating 100 street kids in basic literacy & numeracy, while subsidising each kid with rice and oil every month. VCNV travelled to Calais at the end of October to witness the demolition of the jungle and the relocation of some 7,000 refugees and migrants. Afghanistan has the highest rate of infant mortality in the world 112 deaths for every 1,000 births. Read this account by Henrietta Cullinan who was in Calais during the demolition. I met a young man in the Calais hospital, His heavily bandaged hand looked painful, He was sunk into the bedclothes, his skin grey. How had he hurt his hand? ‘Dougar’ he said. As one of the volunteers, a refugee himself, chatted to him in his own language, he brightened up a bit, realised he was being offered food, clothes. The road to the port crosses over the entrance to the Jungle camp and continually there is the skyline of the lorries trundling left to right towards the ferry, to England. Any picture of the camp taken from a high spot in the dunes has this line of traffic on the horizon. Between the embankment of the road and the camp is a kind of ‘maidan’ where people play cricket and football. But this is also the place where police throw tear gas to stop people running up the bank.